Identical twins Trevor and Ryan Oakes engage in probing studies of visual perception and light through material investigations, discovering new methods in the representation of visual reality through their optical obsession. The duo have constructed a concave easel that avoids the distortions that occur when an image is traced onto a flat canvas. Their low-tech method, as I understand it, involves crossing their eyes until an object doubles next to the paper’s edge, floating over the subject matter transparently, which allows them to “trace” it much in the way some painters used camera obscuras with mirrors and pinhole projections during the Renaissance to trace their subjects. But the Oakes’ variation includes the curvature which is consistent with their findings that human vision is spherical. This optical doubling only has an expanse of 2.5″, so they slice their paper in pieces of that width, which are then joined together when finished to present the final drawing/painting. 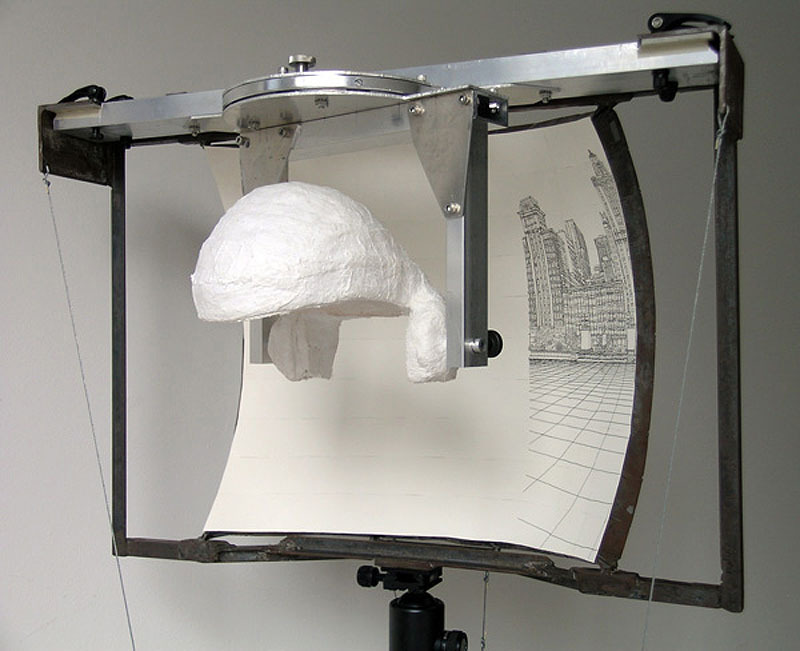 The plaster helmet attached to the easel is movable, but helps keep the head in one spot for extended periods of time. Presently, the Oakes Twins have an exhibit of their work titled Compounding Visions at MoMath in NYC which runs through July 21, 2014. In the meantime, you might spot them in the vicinity with their easel, tracing the Flatiron Building. In the video below, the twins explain their technique directly, which, if you have 5 minutes, is probably the best way to understand it. Photos courtesy of the Oakes, except top image by Aymann Ismail for AnimalNY. This entry was posted in Art, Just Plain Cool, NYC, Stuff We Like. Bookmark the permalink. Next step in this very nifty device should be a light durable travel version that also kids can use!